Looking for a New Jaguar F-TYPE in your area? 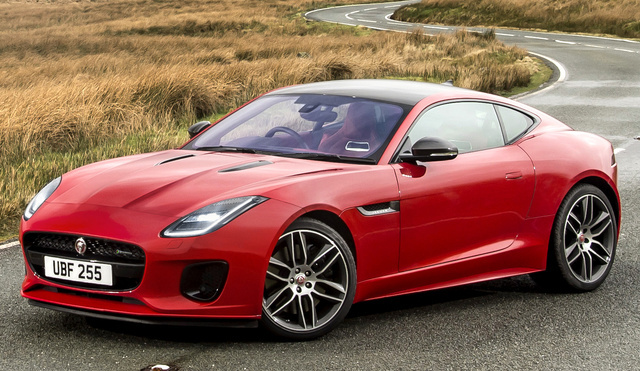 CarGurus has 174 nationwide Jaguar F-TYPE dealers with 2,268 new car listings. 2018 will mark the fifth year of production for the Jaguar F-TYPE. Most automakers would be planning a refresh at this point, and Jaguar is no different, but the visual changes on the 2018 F-TYPE are so subtle you might not even notice it’s gotten some tweaks. The trim lineup and powertrain options, however, are another story. The exterior of the F-TYPE displays some small updates to the front end, with new full LED headlights, larger air intakes, and new bumpers for better visual differentiation between the various trims. Otherwise, it keeps the same flowing curves and taut proportions that have made it such a sharp looker. The interior remains an intimate space, with high-quality materials and unique design traits like the air vents that rise from the dash when in use. For 2018, Jaguar has installed new, slimmer bucket seats that drop 16 pounds from the F-TYPE’s overall weight. A new standard 8-inch touchscreen comes with the latest version of Jaguar’s InControl Touch Pro infotainment system, complete with a new interface, home-screen customizability, and a 4G LTE data connection. 2018 also marks the introduction of Jaguar’s ReRun app, which integrates data pulled from the car with video recorded on a GoPro camera. This means footage of your hot track lap can be overlaid with information on your car’s speed, selected gear, steering wheel angle, and more. For 2018, Jaguar introduces some new trims for the F-TYPE, all of which are available in either coupe or convertible form, as well as new powertrain options. The first two trims are the base trim and a new R-Dynamic trim, which is essentially a base F-TYPE with an added appearance package. Both receive either a supercharged 3.0-liter V6 engine, available in two different output levels, or an all-new turbocharged 2.0-liter Ingenium 4-cylinder engine. The V6 is good for either 340 hp and 332 lb-ft of torque or 380 hp and 339 lb-ft, depending on the output level selected, while the 4-cylinder makes 296 hp and 295 lb-ft of torque. The 4-cylinder is offered exclusively with an 8-speed Quickshift automatic transmission and rear-wheel drive (RWD), whereas the 340-hp V6 can be paired with either a 6-speed manual or an 8-speed Quickshift automatic and RWD. The 380-hp V6 can be had with the manual transmission with RWD or the Quickshift automatic with a choice of RWD or all-wheel drive (AWD). R-Dynamic models come with a more aggressive appearance package, complete with gloss-black exterior trim and unique 19- or 20-inch wheels. The other new trim available for the 2018 F-TYPE is the 400 SPORT, which takes the R-Dynamic’s supercharged V6 and turns the horsepower up to 400. 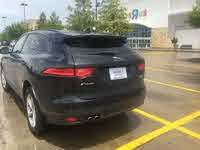 The engine is hooked up to an 8-speed Quickshift automatic transmission and the choice of RWD or AWD. Other changes for the 400 Sport include larger rear brakes, Jaguar’s Configurable Dynamics drive-mode system, a new front splitter, wider side sills, and a rear diffuser and 20-inch wheels finished in dark gray. The 400 Sport will only be available for the 2018 model year. If you’re looking for some V8 muscle in your F-TYPE, you’ll need to step up to either the R or SVR. Both trims feature a supercharged 5.0-liter V8 that makes 550 hp and 502 lb-ft in the R and 575 hp and 516 lb-ft in the SVR trim. An 8-speed automatic transmission and an AWD system help get the power on the road, and each trim receives some additional performance goodies—the R gets larger brakes, and the SVR also adds a lightweight titanium exhaust system, improved engine cooling, and an active carbon-fiber rear spoiler. In terms of safety, the 2018 F-TYPE comes with anti-lock brakes, stability control, a full suite of airbags, and rollover protection bars for the convertible. Higher trims come with front and rear parking sensors, a reversing camera, traffic-sign recognition, and blind-spot monitoring with rear cross-traffic alert. New for 2018 is a self-parking system that can find a parking space and parallel park the car on its own—all the driver needs to do is control the throttle and the brakes. The 2018 Jaguar F-TYPE arrives at dealers this spring. What's your take on the 2018 Jaguar F-TYPE? Have you driven a 2018 Jaguar F-TYPE? Enter your zip to see incentives for a new F-TYPE in your area.